The 2013 Fort McHenry Silver Uncirculated Coin is offered by the United States Mint as the fourth of five strikes of the America the Beautiful Five Ounce Silver Uncirculated Coin™ series. Located on the reverse of the coin is a design emblematic of Fort McHenry National Monument and Historic Shrine located in the state of Maryland. Each of these coins is struck from five ounces of .999 fine silver to a diameter of three inches. These are the same basic specifications used by the US Mint for another series of strikes, the America the Beautiful Bullion Coins. While similar in appearance, the two series can be differentiated by the inclusion of a 'P' mintmark on the uncirculated coins. The mintmark indicates the coins were struck at the US Mint's facility in Philadelphia. The bullion coins are also struck in Philadelphia but contain no mintmark. Fort McHenry National Monument and Historic Shrine of Maryland was created in 1939, but had actually been a national park for several years previous to that. The site preserves the location of Fort McHenry which served an important role in the protection of Baltimore Harbor in the early days of the nation. Shown on the obverse of the coin is a portrait of George Washington, the first President of the United States. The portrait was originally designed by John Flanagan and has been featured on circulating quarter dollars (with minor variations) since 1932. Obverse inscriptions include UNITED STATES OF AMERICA, LIBERTY, IN GOD WE TRUST and QUARTER DOLLAR. 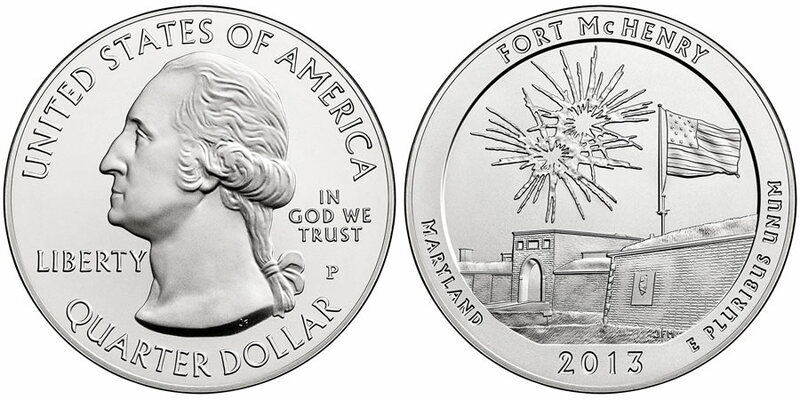 The reverse of the coin contains the design emblematic of Fort McHenry National Monument and Historic Shrine. Reverse inscriptions include FORT MCHENRY, MARYLAND, 2013 and E PLURIBUS UNUM. "999 FINE SILVER 5.0 OUNCE" is inscribed on the edge of each coin to indicate its weight and fineness.